Cooking vegetables and pasta in vegetable broth always enhance the flavor. But instead of buying canned ones how about making it in the home that too in bulk? 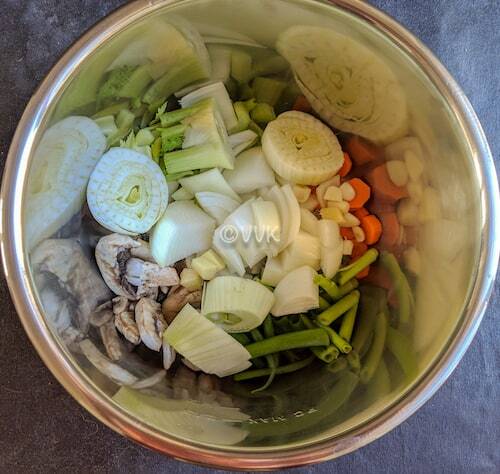 Yes, thanks to Instant Pot, you can make this flavorful vegetable broth in large quantity at home quickly. 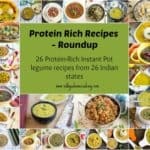 Just chop all the veggies and dump it in with water in the Instant Pot and let it do its magic. 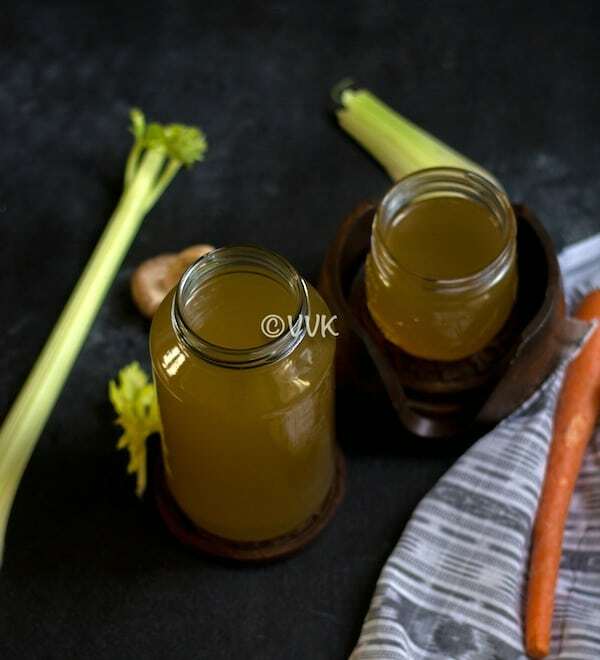 When the cooking is complete, strain it and voila homemade vegetable broth is ready. Now you don’t need to worry about the sodium content or preservatives. 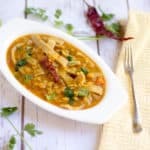 Between, if you are wondering what the difference between stock and broth is, then you got to read this article from fine cooking. I did not include any salt in this recipe. I won’t recommend adding salt while making the broth; you can add/adjust salt when you use the broth in a dish according to that recipe. If you are relishing this as a clear soup, add salt and pepper just before serving. 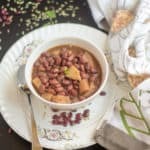 What vegetables should I use for making the broth? You can use vegetable of your choice, and you can adjust the amount according to your preference. I personally love the flavor of fennel bulbs, and I always add it when making the homemade broth. So for this recipe, I used fennel, onion, mushrooms, carrot, garlic, ginger, celery and green onions. 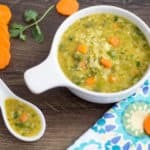 Can I reuse the vegetables used for making the broth? Believe me; I had the same question too. I couldn’t just discard those veggies. 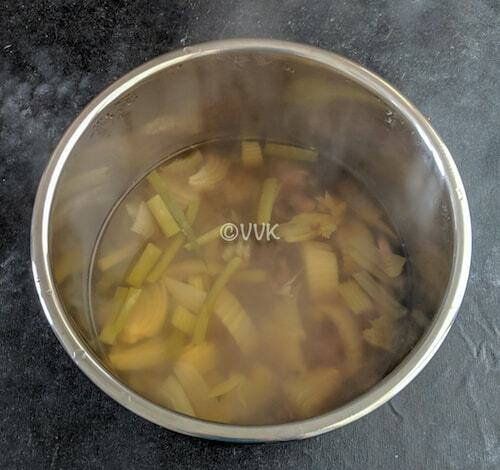 But after the prolonged cooking, all the flavors including the nutrients are now in the broth. So there is no point in reusing them. I strain the broth and also squeeze the veggies as much as I can to extract the juice. Some say you can give the vegetables to dogs. But I have never tried it with my dog. You can always add them to your compost. Can I relish this broth as clear soup? Oh yeah definitely. I included ginger and turmeric for the very same reason. The winter weather always calls for something warm. 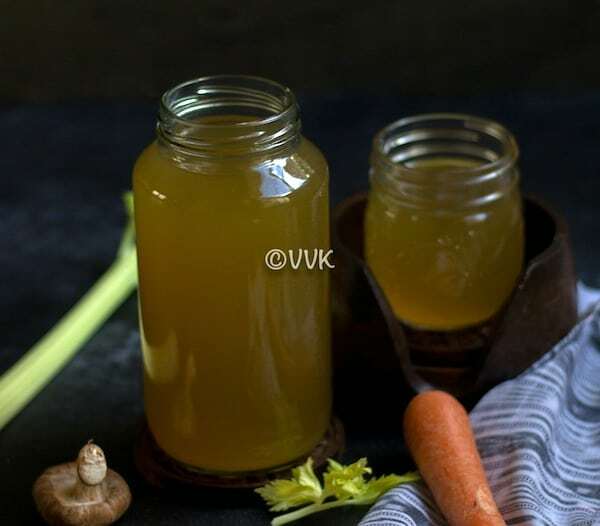 I know many prefer green tea, but you can have a glass of this soothing broth with the goodness of turmeric and ginger. I am sure you will love it. Rinse all the veggies thoroughly and chop them into chunks. Do not discard the green part in the green onions. Chop the garlic and ginger into small pieces. Add all the chopped vegetables to the instant pot and add the 8 cups of water. Add the turmeric powder and mix. Cook the veggies on high-pressure manual mode for 40 minutes and let the pressure release naturally. When pressure drops entirely, open the lid and strain the liquid. Allow the veggies to cool and squeeze the juice as much as you can and discard them. Allow the broth to cool completely and store it in an air-tight container and refrigerate it. It stays good for up to 5 days when refrigerated and you can freeze for longer shelf life. Add more or fewer veggies according to your preference. 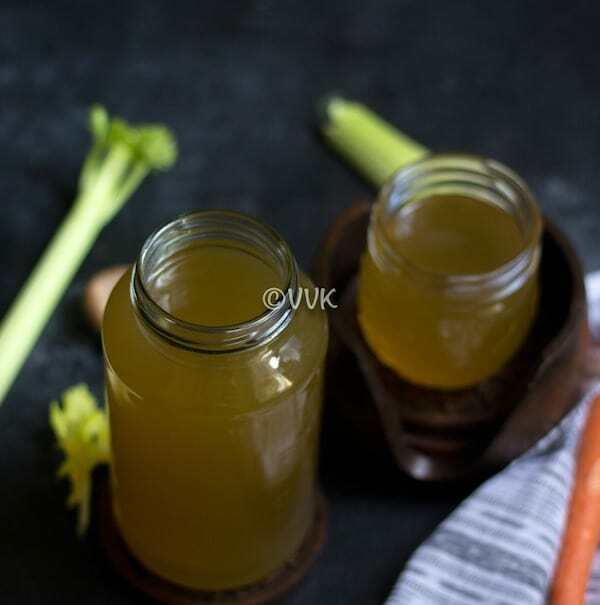 PS: If you try this vegetable broth, please don’t forget to comment and rate this recipe. Also, please check out my videos and do subscribe to my YouTube channel. 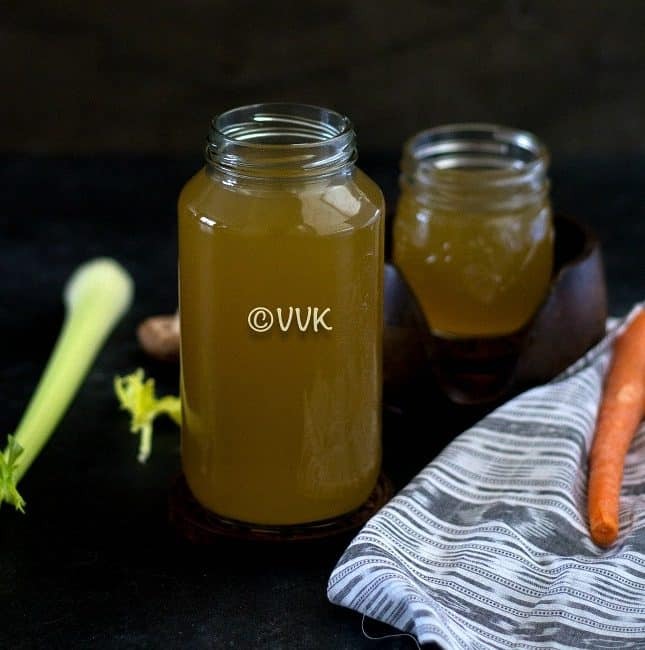 Homemade vegetable broth with the mild flavors of ginger and turmeric made in Instant Pot – A must have staple in your kitchen. When pressure drops entirely, open the lid and strain the liquid. Allow the veggies to cool and squeeze the juice as much as you can and discard them.